Point - in this case the basic object will be placed at the position specified by the point and will be oriented the same way as when it was saved to a *.node file. Line - in this case the basic object will be placed at the position specified by the first point, while the second point determines orientation of object's forward direction vector (positive Y). 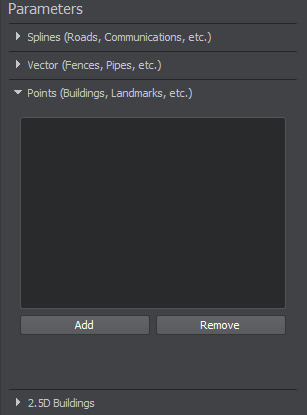 On the Sources panel, select the Vector data source type and the following settings will be displayed in the Points tab of the Parameters panel. 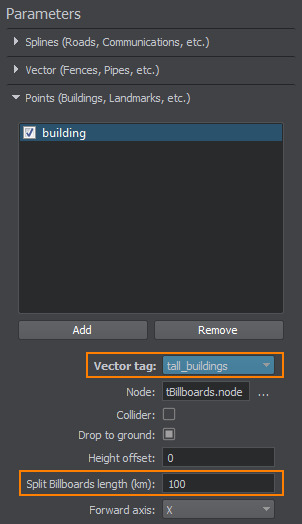 Add a basic object for generation by clicking Add button at the top of the Parameters panel and specify object's name. 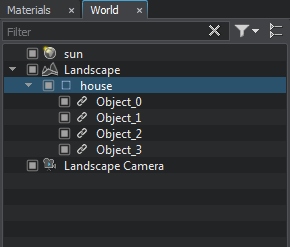 You can add as many objects as nesessary. Axis which determines orientation of the basic object: X, -X, Y, -Y. If you are going to update some of the existing point objects, check only the changed ones. 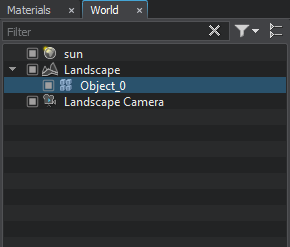 At that, the other objects will remain the same after terrain generation. Here is a terrain fragment with houses generated on the basis of vector data using the basic mesh object we created. 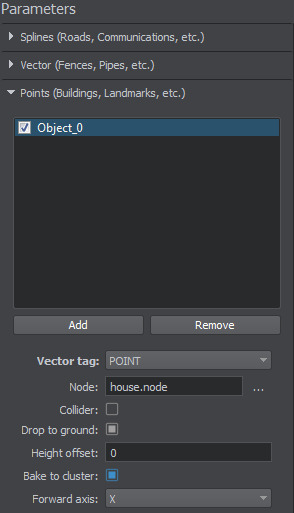 To regenerate some of the existing point objects, check only those objects that should be updated, click Generate and select Vector objects option. Only the specified point objects will be regenerated. At that, the other ones (that haven't been checked) will remain the same. If you are going to regenerate only point objects, the other vector objects (spline, vector and ) must be unchecked. You can also splace billboards at certain points of the terrain. Step 2 can be skipped, as you can use the same tag as for buildings or structures, on the top of which the aircraft warning lights are to be placed. In the Tag field you should select the same tag as the one you used for buildings or structures, on the top of which the aircraft warning lights are to be placed. Thus, the number of generated Billboards objects is also affected by the total number of points, where the billboards are to be placed.